An outstanding example of homemade flag making in the 20th Century, especially rare on several counts. The obverse of this beautiful flag consists of one of the most scintillating star fields witnessed on the canton of an American Flag. One large central star and four medium stars, one in each corner, are surrounded by the remaining 43 smaller stars, tightly packed amongst each other in a jostling, seemingly random crowd. The reverse of this flag is also intriguing in that it possesses a single center star, flanked at each point by a smaller star, with tips aligned. This extraordinarily rare pattern represents the addition of California as the sixth state to grant Women's Suffrage in November, 1911. 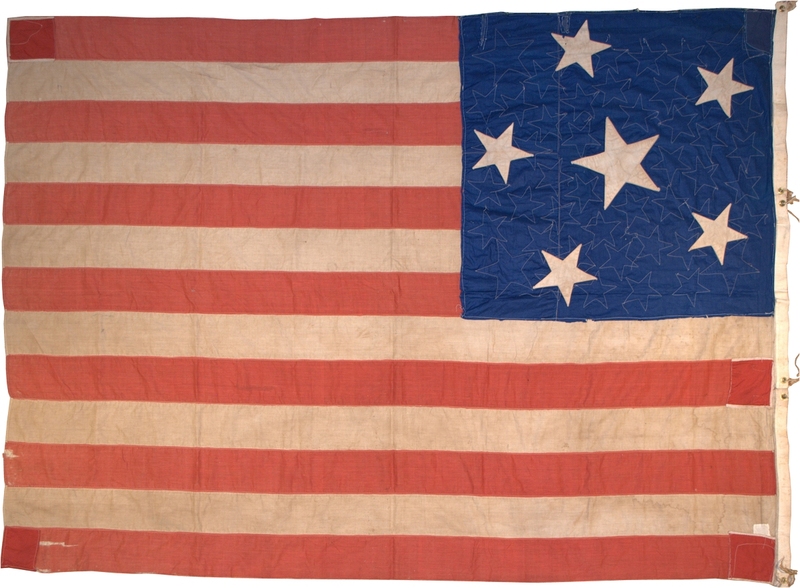 It is the only surviving suffrage flag in the stars and stripes pattern that I am aware of. One exceptionally rare trait belonging to this flag is the indication of a spiral pattern that adds hidden order to the chaotic jumble of stars. Another exceptionally rare trait belonging to this flag is its unique individuality and folky character at a time when the vast majority of flags were mass produced. It is very unusual to witness such a distinct star pattern on a 48 star flag. Until the introduction of the 48 star flag with the admission of New Mexico and Arizona in 1912, no legislative guidance specifically addressed the official pattern for stars on the flag. Consequently, Americans freely populated the starry constellations of their homemade flags to their own whim. 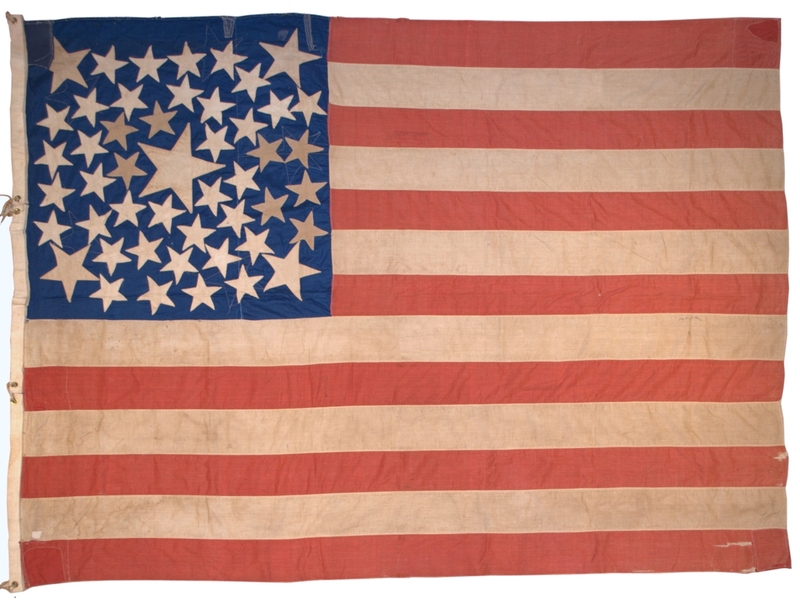 Coinciding with the introduction of the 48 star flag in 1912, President William Howard Taft passed an Executive Order on June 24, 1912 establishing the official proportions of the flag and the arrangement of the stars, being six horizontal rows of eight, with each star pointing upward. True to the spirit of American individuality, the maker of this flag either ignored the legislated status quo or produced the flag before the executive order, and thankfully arranged this gorgeous canton for future generations of admirers to enjoy. Due to the construction of the flag, the aging of the material, and the fact that as time progressed in the 20th century making homemade flags became much less prevalent as mass production of flags increased, this flag is most likely from an earlier era circa 1912-1930. It's quite possible that the flag actually pre-dates the July, 1912 introduction of the 48 star flag (and the June, 1912 executive order legislating the layout of the stars) with the flag being constructed in early 1912 in anticipation of the impending statehood of New Mexico and Arizona.